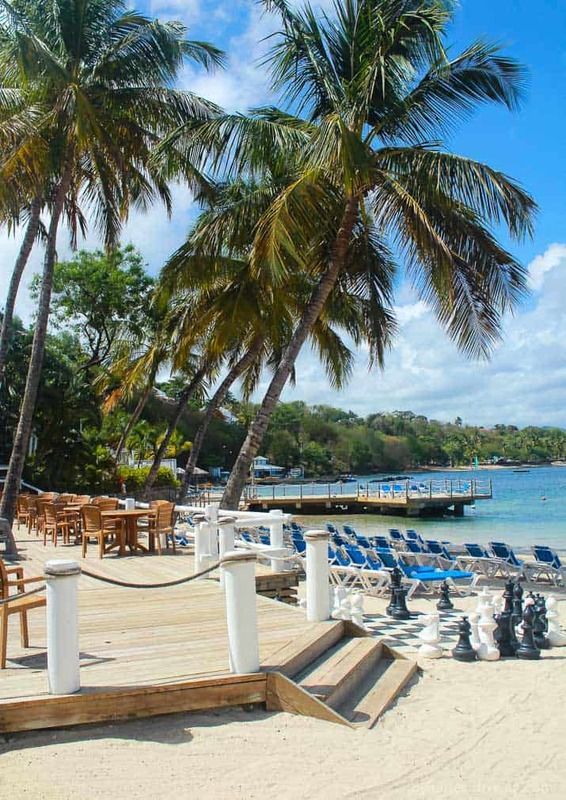 Traveling to St. Lucia and all about our stay at the Windjammer Landing Resort & Spa, paradise in the Caribbean! It is finally here, what so many of you have been asking for! How was St. Lucia? Well, today I’m gonna tell ya! Hubbie and I try to take a mommy daddy trip, without the kiddo once a year. We both feel like its really important to get away and just reconnect with each away from the temper tantrums, 5am wake up calls, work life, and all around chaos that is life as a parent. Typically we will go to Mexico because it’s just a hop, skip, and a jump away from Texas but this year we wanted something a little different. One night I just started searching good ole google looking for places to stay in the Caribbean. To honest, we were going back and forth between St. Lucia and St. Martin; but I had seen WAY too many pictures of airplanes to close for comfort on the beach in St. Martin and decided that St. Lucia was going to be our destination of choice. 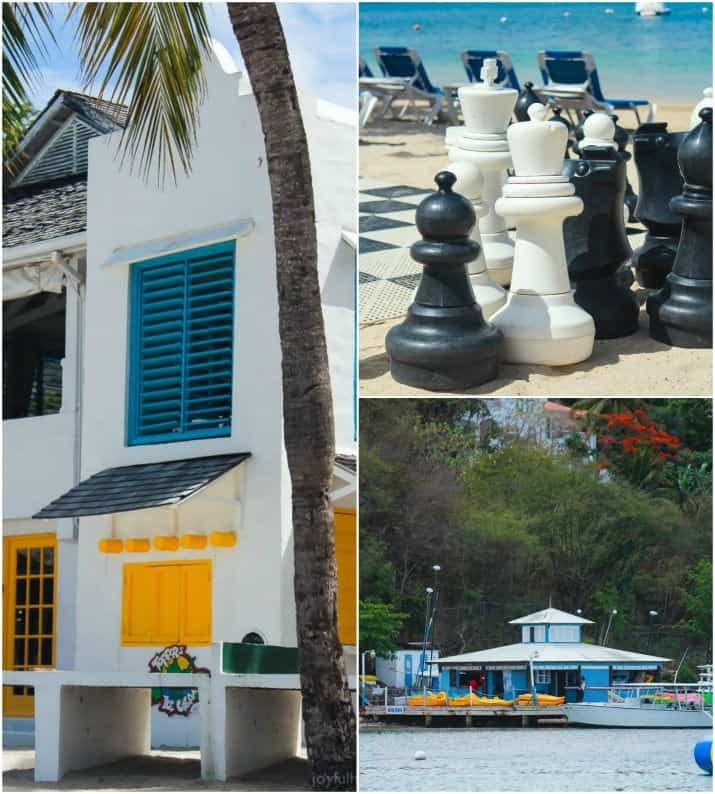 As I started searching through Trip Advisor (our go to website for travel accommodation recommendations) I got pulled in by this cute family friendly resort called Windjammer Landing Resort & Spa. It was a resort that was located on one of the many mountains and had villas all the way up the mountain, all facing towards the bay that they were located in with their own beach. It also had an all inclusive option so I was sold. I might like to cook at home, but when I’m on vacation … I’m on vacation!!! I just want to be wined and dined while not having to worry about a thing. 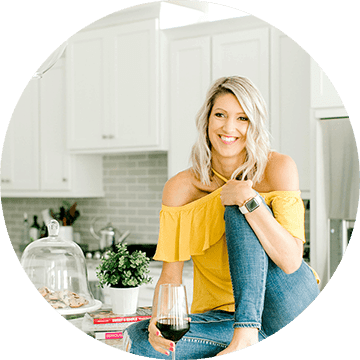 High maintenance, maybe … but once you do it you will LOVE it! The down side about the resort is that its a two hour drive from the airport to the hotel, whew! But honestly it wasn’t that bad. Mike found this awesome tour company that does airport pickups and Hans our driver from Serenity Tours had a cooler of Pitons (the locally made beer that tasted like Corona), local made rum punch, and water waiting for us in the car! We stopped about halfway through our drive and picked up fresh mangos at a fruit stand along the road. St. Lucia has 50 different kinds of mangos grown on the island so of course we needed to try them! After our mango adventure Hans pulled up to this stand/restaurant that serves fresh bread made daily. Little did we know that we would be craving this Creole Bread the rest of the trip! This stuff was insane! Like out of bounds insane! It was hand kneaded dough, stuffed with butter and english white cheddar cheese then formed into the shape of a small french roll and cooked in a stone oven with wood fire! My mouth is drooling as I’m telling you! Sooo goood!!! If you ever go to St. Lucia, book with Serenity Tours its an awesome small tour company on the island and they will hook you up! (we also used them for our private Sailboat Charter! Ok, so when we finally got to the resort it was a little late to make reservations at one of the five restaurants they had so we went to Jammer’s Bar & Restaurant which was right on the beach (no reservations needed). It was the perfect ending to a long day of travel and this is where we met one of our favorite bartender’s Barry! Usually we would end our nights down at Jammer’s after we had dinner because they had live music playing every night, and well Barry was there behind the bar singing and dancing away and it just made me happy! Most days we were camped out right under one of those tiki hut umbrellas, which was about halfway to the tiki hut bar and halfway to the restaurants for lunch time. It was a rough life I know. I was able to finish two books out there, and get a nice start to my summer tan! The beach was very well kept. The water was perfectly refreshing, not to hot and not to cold, great to walk out and take a dip in. 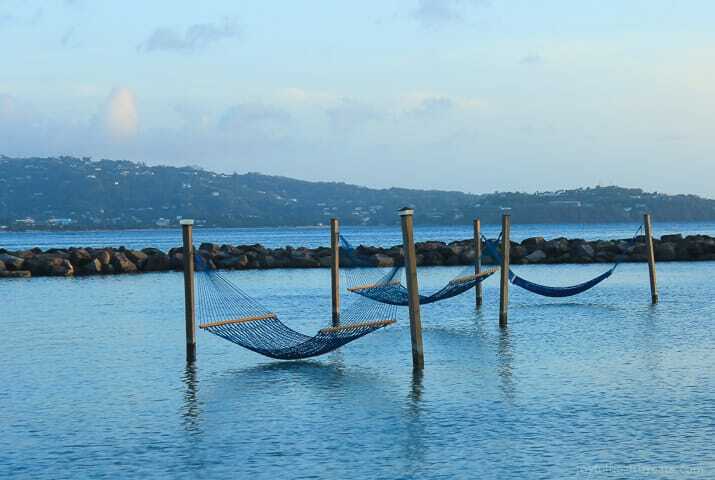 On occasion you might see a crab, stingray or fish swim by on one of those “dip trips.” Every once in a while we would walk out to the hammocks hanging out over the ocean just high enough to barely touch the water when you’re laying in. 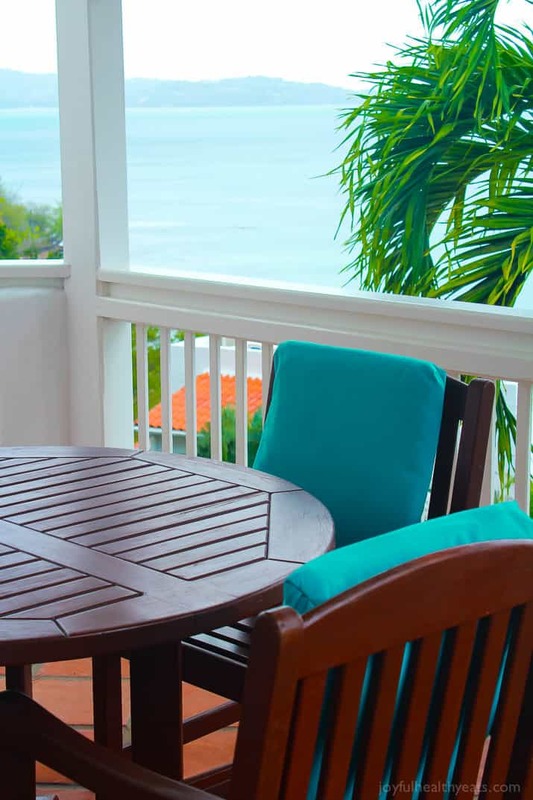 The accommodations at Windjammer were amazing! It was island life to a tee. We were staying in a villa about 1/3 of the way up the mountain. Our villa was facing the ocean and had two stories. The upstairs was where the master bedroom and bathroom were, we also had a walkout balcony off the master bedroom. 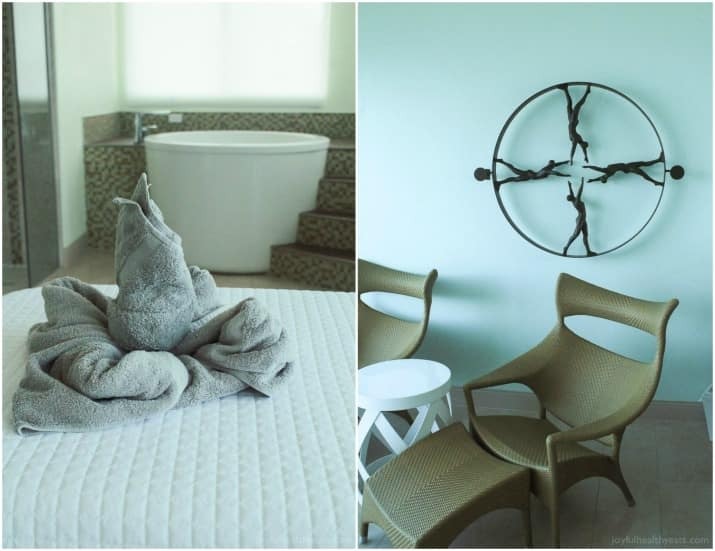 Then downstairs had a full kitchen, large dining room table, living area, another bedroom and bathroom that slept two more, and a large wraparound balcony with a private plunge pool that overlooks the ocean. It was incredible! The entire downstairs, besides the bedroom was open air – it was so cool! My favorite part about the villas is they were all white washed with tan mediterranean tile and against the bright blue water – it was absolutely gorgeous! Paradise for sure! It almost reminded me of the Greek Isles! Pretty sure I could LIVE there! While we were at Windjammer we did a couple activities, after all, you can only sit on the beach for so long. Gotta change it up a bit! Windjammer also just remodeled there Spa area. One of the days we were out on the beach, Diane, one of the masseuse’s came down and we ended up talking to her for a while. She was super sweet and was joking back and forth with Mike, which he appreciates, so we ended up signing up for a 60 minute couples massage. Ya’ll!! This massage was HANDS DOWN one of the best most relaxing massages I’ve had at a resort so far! The resort itself has a custom made scent that has lavender and grapefruit in it along other things and it smelt like heaven! 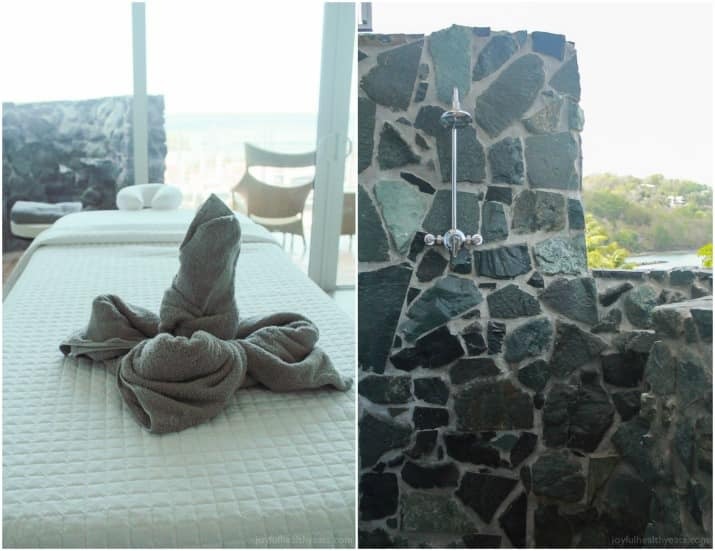 Our couples room had a indoor shower, outdoor shower, large soaking tub, and a large window facing the ocean. The massage itself was incredible! We actually recommended it to three other couples that we met at the resort and they said the same thing! Best massage they’ve had! Diane and Gail (the two masseuse’s we had) are magic workers! If you go to Windjammer you NEED to visit the Spa! Ok, last but not least the food! While we were at the resort I actually got to meet the Executive Chef, Roger Meier, who is Swiss and has been head chef at places all around the world including Europe, Asia, Central American, and all over the Caribbean. His overall knowledge of food and travel experience aids in the diverse cuisine at the resort. Chef Roger is over 5 restaurants and 81 chefs at the resort and with only being there 6 weeks he definitely has a large task on this heads. Alot of the cuisine has remained simple and the same for quite some time but Chef Roger gave me a glimpse of his vision for the future of Windjammer and it makes me want to go back asap to see the changes he makes! I know its going to be incredible! Here is a little teaser for what is to come and already in the works! Papa Don’s, a restaurant up the mountain overlooking the bay is going to be an Italian Restaurant with pasta’s and stone oven pizzas. Upper Deck, a restaurant located on a deck overlooking the beach is going to become a high end Steak & Seafood Restaurant with a Caribbean flare and custom wine list. 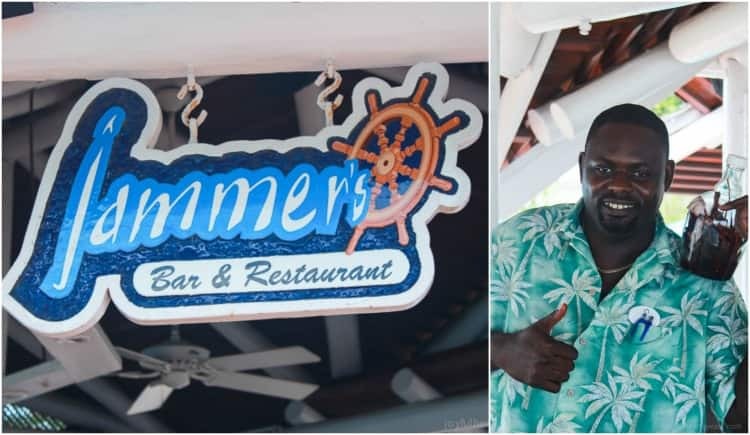 Jammers, located on the beach which is now more of a bar and restaurant type feel is going to remain a more laid back restaurant. But is going to become more of a family style restaurant where you could order 4lbs of pasta with different kinds of sauces or a 24 oz. 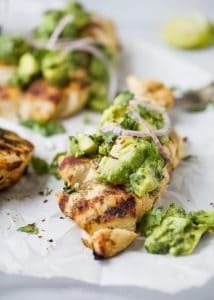 burger that can be cut into large wedges to split family style. 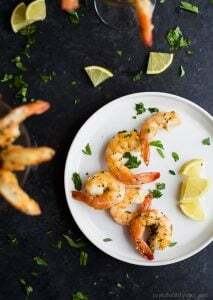 Dragon Fly, another restaurant located on the beach is going to be a restaurant that has theme nights, such as Texas BBQ night or Surf and Turf night. 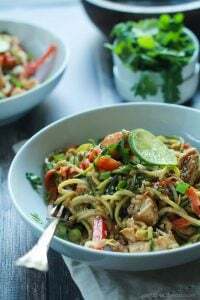 Dragon fly is an upscale restaurant as well but allows the chefs to be creative with the recipes each night with the fresh product they have on hand! And lastly, Embers, which right now is just a lunch place on the beach is being remodeled to be a high end fine dining place right on the beach! 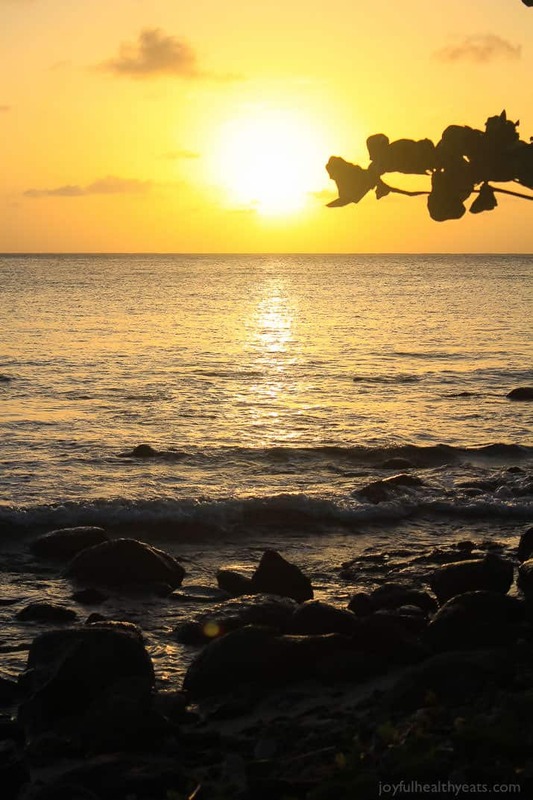 (like you can stick your toes in the sand) It will be the main place those honeymooners will want to go to have a romantic evening with sunset. 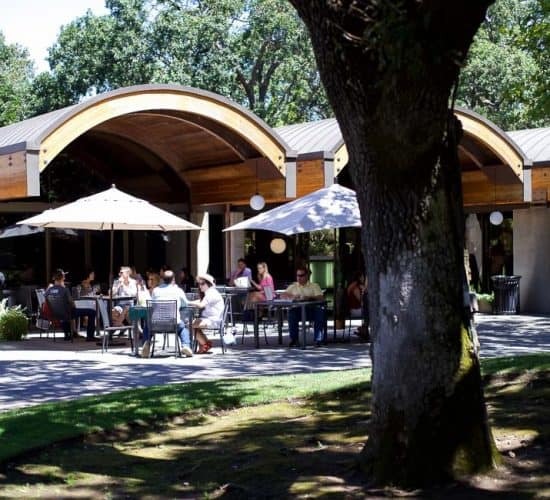 Each restaurant will have its own separate wine selections to differentiate the restaurants. The changes Chef Roger is making along with the team atmosphere he is creating has me itching to go back to see those changes realized. Well, thats a wrap folks, I hope you enjoyed the recap. If you have any questions or need any recommendations let me know. But let me leave you with this thought.. you need a vacation! *I was compensated for this post, but all opinions are 100% mine and truthful! 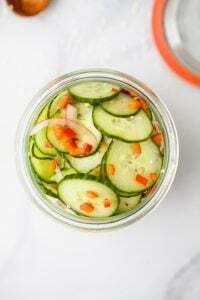 Thanks for supporting the companies that support Joyful Healthy Eats. St Lucia is beautiful! I visited once about 10 years ago and can’t wait to go back. 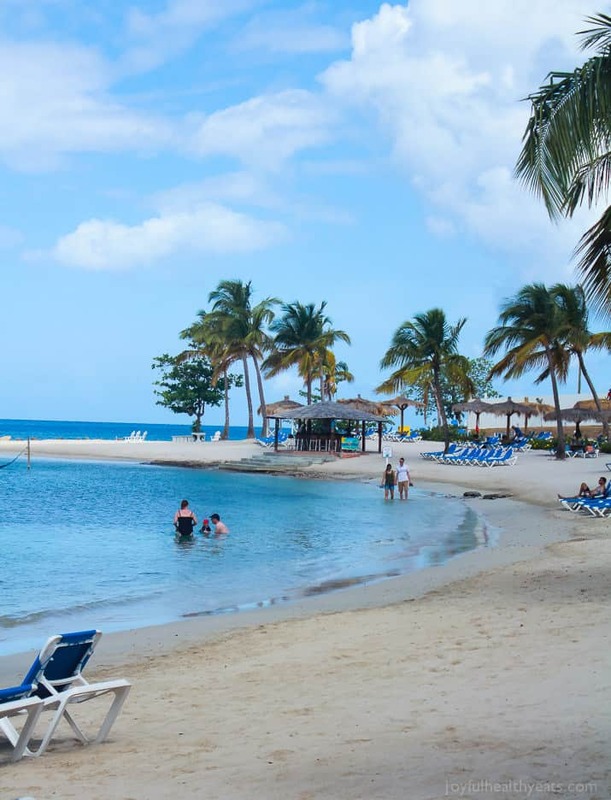 The Windjammer Landing resort looks like a great place to stay too. Gorgeous sunset views too! It really was! I loved the privacy of this resort, it was nestled in this little cove and everything about it was peaceful! Probably one of the more relaxation vacations we’ve been on and the people are so sweet! You and hubs definitely need to plan on going back! Those hammocks, the views, and 50 types of Mango?! haha.. I know right! HEAVEN! The Windjammer looks so relaxing! And so gorgeous! What an amazing vacation!!! 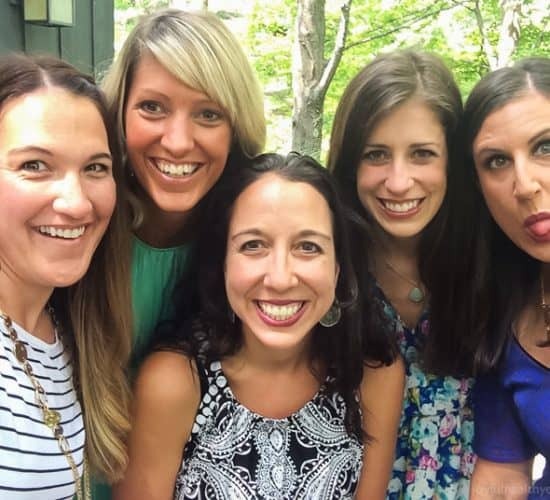 These photos are beautiful and it sounds like you guys had so much fun! Thanks Heather! We really did have a blast! We have never been ones to travel (don’t we ever have!) but you are really convincing me! 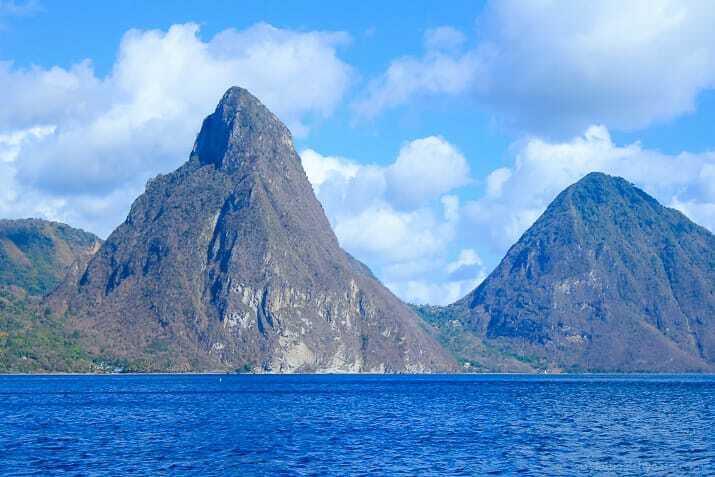 St Lucia looks beautiful! And the whole mommy-daddy trip sounds like a great idea. We only have one child but she is stuck to me like glue! You totally need to kacey, its good for the soul and the mind to just check out for a little bit and enjoy a beautiful place! OOh I am so jealous! You had a wonderful vacation in a beautiful location. Thanks for sharing this with us all! Stunning! OMG look at that water! You lucky girl, you!!! Right! The water is amazing.. its like a postcard! Oh my word! That is beyond amazing and now I REALLY want to go there! Do it! Every body needs a vacation! This looks seriously incredible!! I am showing this to Dell. We have to go. It looks like you guys had an amazing trip. My husband and I need to be better about taking trips without the kiddos. I totally want to go to St Lucia now! Do it! 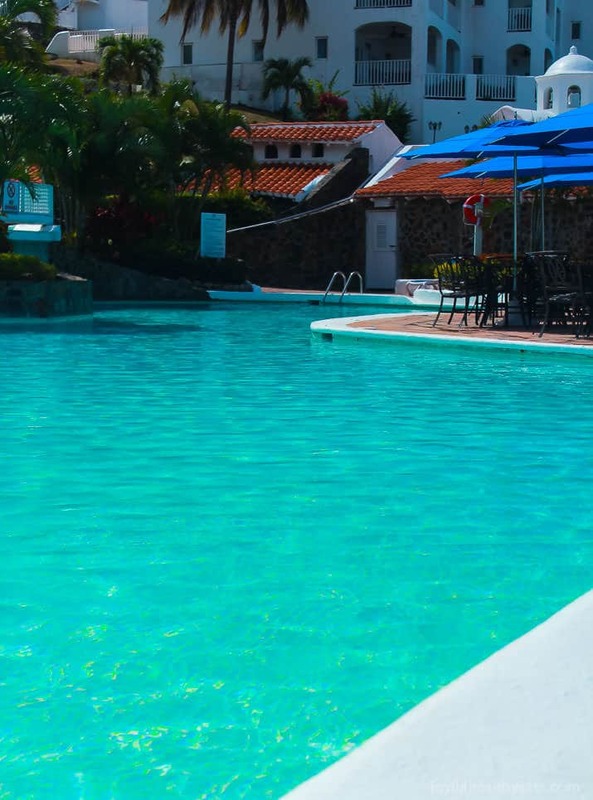 It will be so good for you and your husband and st. lucia is beautiful! Thanks for the post! I had a flash back of last August when I visited Windjammer with my two best friends. It was a trip of a life time. The spa and beach were relaxing and the food was delicious. Would love to go back and visit again one day. Oh… yeah! So glad someone else has been there before and appreciates it! I would totally love to go back too girl! Oh heavens! This is what paradise looks like! To that water, to that fresh bread, to your breathtaking views! I know what I am going to be begging Dustin to book so 😉 So glad you and your hubby had a great vacation and much needed time together. Hope you came back relaxed and revitalized! We both came back refreshed, it was wonderful. If I need to tell dustin let me know… it needs to happen you will both LOVE it! 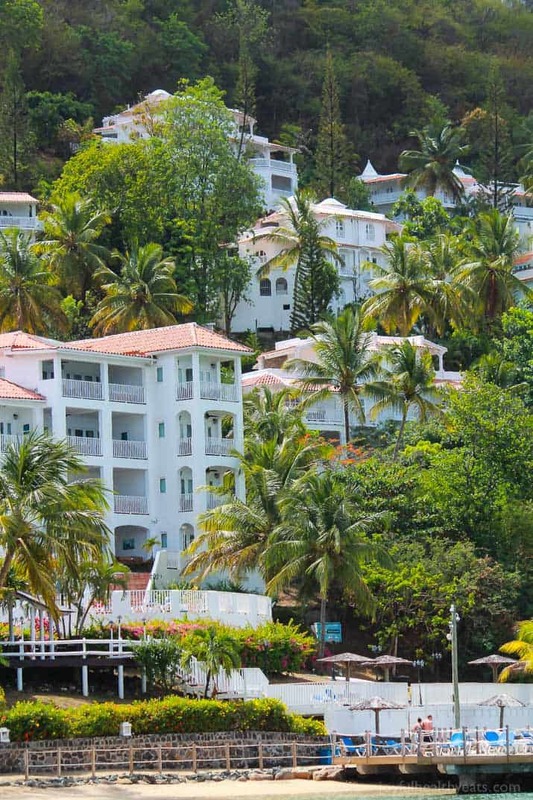 Did you find yourself leaving the resort to explore the island during your time in St. Lucia? If so, did you rent a car or book excursions? yes, we left the resort. One time we did it through Serendipity Tours and the other time we just got a cab. Hello! Looks like you had a great time. 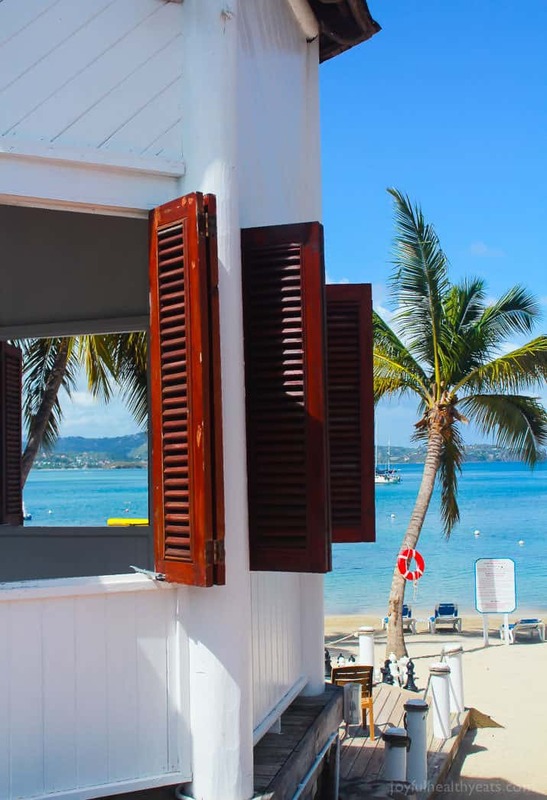 I am considering Windjammer for our destination wedding in 2019. Quick question (because by fiance is interested in the inclusive-package details)… .Are the motorized sports like wakeboarding included as well? Or are those extra? Were there any hiking trails on the property that you know of??? Thanks!! Hey Kelly, it’s a great place. We absolutely loved it and the staff are incredible! The motorized sports are not included but the other water sports are (snorkel, paddle board, etc.) There aren’t any hiking trails on the property but the property itself is on a big hill/cliff and the condos are all up and down the hill so there is plenty of tough walks, which is what we did most of the time.